On Friday, he was second fastest next to polesitter Ryan Crane of Panama City. Grill jumped out in front on the start before Crane passed him on Lap 4. The pair ran 1-2 through the next 58 laps, which ­ for Five Flags ­ were amazingly caution free. Points leader Eddie Mercer of Pensacola started fifth, dropped back early, then worked his way back up to fourth when the only caution came out after Jay Middleton lost power on the track. Eight laps later, Grill drove past Crane in Turn 3. Over the final 25 laps, Pensacola drivers Donald Long and Scott Carlson worked their way toward the front. As Grill was pulling away, the next four became a freight train as Crane held off Mercer, who held off Long, who held off Carlson. 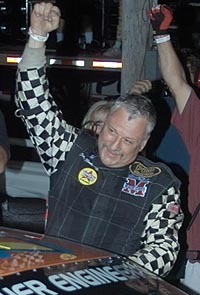 Augie Grill knew Five Flags Speedway as a crew chief, helping Wayne Anderson win the 2001 Snowball Derby. He showed Friday night he can handle the track as a driver. 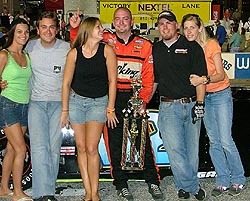 In his first race behind the wheel at Five Flags, Grill of Birmingham, Ala., led the final 34 laps to capture the Super Late Model Papa John’s 100 Blizzard Series race. Grill, 28, started driving only three years ago and it was his 22nd Late Model race. He scored his first Late Model victory just a week earlier in a 125-lap event at Montgomery, Ala.
Unofficially, Mercer leads Long by 10 points as the top two drivers earn provisional starting berths after five races in December’s Snowball Derby. Carlson trails Mercer by 20 points, while Crane is another five points back. Grill, whose car wasn’t ready for the first Blizzard race, plans to run the rest of the series to prepare for the Snowball Derby ­ as a driver this time. 22 cars started Papa John's 100 Friday night, the second of five Blizzard Series races at Five Flags Speedway in Pensacola, Florida. Most of the drivers in the field were familiar to the fans at the historic track, yet a few of the drivers had traveled a long......long way for a night of racing. A.J. Ganino of Lebanon, Ohio and his crew put 746 miles behind them on their way to the Florida panhandle. This was Ganino's first race at Five Flags Speedway, though he had tested there two years prior to Friday's race. 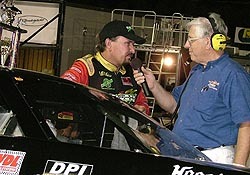 Though it was Ganino's first race at Five Flags, he had former Snowball Derby champion, Dave Mader III as a crew chief for the night which can't hurt. "The only thing I know about this track so far is that it likes to eat tires." Ganino told us. now in Ontario are averaging close to 64 degrees during daylight hours, with no humidity. This week in Pensacola a new record high was recorded at 97 degrees with a heat index of 108 with some pretty nasty humidity. Welcome to the south Shaun. So how did they do? McWhirter crossed the line in 11th position, with Wilson just two cars behind him in 13th. A.J. Ganino finished in the 16th position. Local favorite, and short track heavy hitter Wayne Niedecken Jr. had the car dialed in and qualified 3rd fastest behind Crane and Grill. Then he ran into trouble in pre-race tech inspection and virtually disappeared for the night. An official announcement was never made as to what happened to Niedecken, but we were told that he had a carburetor infraction and would have to start in the rear. After that, Niedecken was seen loading up his hauler and called it a night. 2001 ROMCO Series champion, Donnie Wilson traveled 852 miles, nearly 15 hours, to Pensacola, Florida Friday night. Wilson said is going to try to make the field in the remaining Blizzard Series races, and is looking forward to trying to qualify for the 38th Annual Snowball Derby in December. Wilson also finished fourth in this year's Rattler at South Alabama Speedway in March. Dave Mader III is back in town. Mader III of Sherrill’s Ford, NC is still carrying on the family tradition of winning big races at Mobile International Speedway. Mader’s latest win came Saturday, May 28 in the second of five 100-lap Allison Electric/Jam Construction Super Late Model races. Mader started the race from the fifth starting position in his No. 118. The fast qualifier, Donald Long of Pensacola, FL was on the pole. Cale Gale of Irvington was on the outside pole. Stanley Smith of Chelsea, AL and Wes Loyd of Covington, LA made up the second row. Mader was on the inside of the third row and “Fast” Eddie Mercer was on the outside. During lap one, Stanley Smith and Wes Loyd got together in Turn 3. Cale Gale was also caught up in it. Smith’s No. 49 and Lloyd’s No. 57 were damaged too much for them to continue, but Gale did return to the track, even though he had to go to the rear of the field of 19 other cars. After 10 laps, the top-five cars were Long, Mader, Ryan Crane of Panama City, FL, Mercer, and Gale. During the first half of the race, there were three brief caution periods. “Boy, I’m going to tell you the Fisher Engines/Press-A-Dent Monte Carlo was right,” said Mader III. Gale’s No. 83 Keller/Smith Monte Carlo suffered some body damage during the lap-1 accident, but in spite of the damage, he had a strong finish. During lap 43, Mader, who had been working on Long, was able to get by for the lead and collect the Miller Lite Halfway leader bonus at lap 50. The night’s fourth caution came out on lap 57 after Kevin Rehwinkel spun. Gale continued to move up and by lap 64 was second. But that was as far as the Irvington driver could go. For the remaining 36-laps, Mader put the hammer down, and cruised to his first MIS victory of the season.